I have to admit, this has been a strange week. My usual schedule; my comfort schedule, has purposefully been altered. This is the longest I've gone without sharing a blog post in the last almost 5 years. (Even when I've been in the hospital I've managed to get my hands on my computer) It felt a little like mourning, a little like freedom. But either way it's something I knew I had to do. I said I'd post when I had something interesting to share with you all, and right now even though I have lot's of things on my mind, and still can grab onto some inspiring things, I've known that I needed to slow down and not feel any pressure and "compulsion" to blog. I think there have been a lot of us that have been blogging for awhile that can agree, blogging can become more than a little addictive. It's been a "good" habit for me, but still one that keeps a person always on the lookout for that photo, that topic, that subject that is begging for attention. So, this little dollhouse is something I've wanted to share for this last year, but just haven't gotten around to working on. Back in the 80's when we lived in Marietta, Georgia, dollhouses and miniatures were all the rage. I had my father-in-law put together two dollhouses, one for each of the girls, then I painted and decorated them. My older daughter is and has always been a person that loved to play with small things. The younger daughter has always been a bicycle, exercise, ball playing nut, so she wasn't quite as "into" the miniature stuff as her sister. This one is the younger daughter's. Even though she's been married for eleven years, this has set in our attic until last Fall when I asked her if she'd mind if I repainted it and use it for "decor". I think she was secretly glad for me to take the responsibility and itsy bit of guilt off her shoulders. It's been knocked around a lot and some of the gingerbread trim was lost years ago. The posts are a little wonky, but it still needed to be loved. A couple of coats of White and ASCP Paris Grey for the shutters and trim, did the trick. just want it to be for decor right now. until then it's not going to show. country blue and a mauvy-red. And this last pic is from a sale at The Seedbox Antiques Spring Sale in 2011. 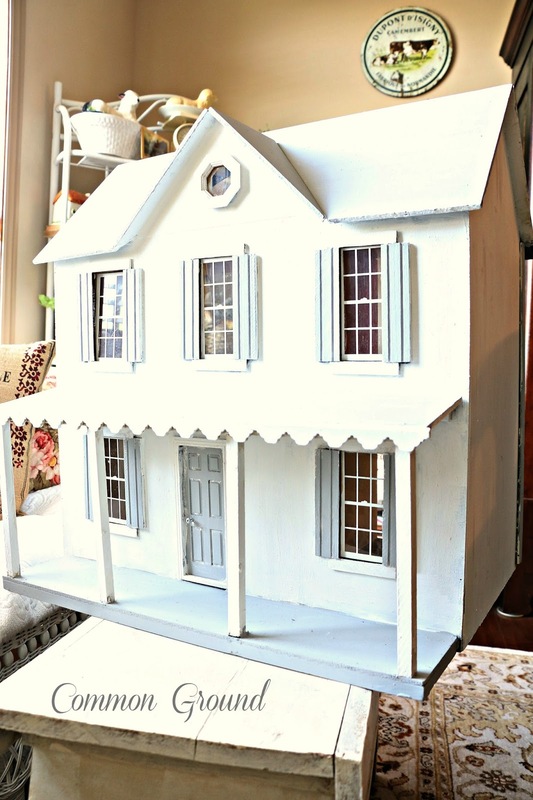 I just fell in love with this old dollhouse sitting out on their porch. I should have gotten a better pic of the weathervane...can't remember now what it was. So now I'm just waiting for my husband to set this up on one of my pieces of furniture in my studio. And speaking of studios, I've lost all control of it. It has turned out to be "temporary housing" for any and all things that needed to be brought over here. It's a mess. On the big house, we're down to patching nail holes, working to pack the garage, and finishing up some outside work...we're shooting for mid-June to list it. I haven't been able to do much of the work. My hubby says he just wants me to "supervise". What a great doll house, and I'm betting you are secretly happy that your daughter let you use it, so it looks like it worked out for both of you! It's a great decorative piece. Can you believe we were all into those awful colors in the 80s? I had them, too! I enjoyed the post, and I'm remembering you in my prayers. Love the new look to the doll house, Debra. My Dad put one together for my daughter back in the late 80's early 90's and it has the same type of colors. When we all moved the doll house went with her to her new house. She is waiting for my granddaughter to get just a little older and then I think we will redecorate it. I think they are great for décor if you have the room. I would definitely have looked for an armoire to place it on back at our old house. Love the dollhouse. Makes me want to work on mine again. Take care of Debra ! 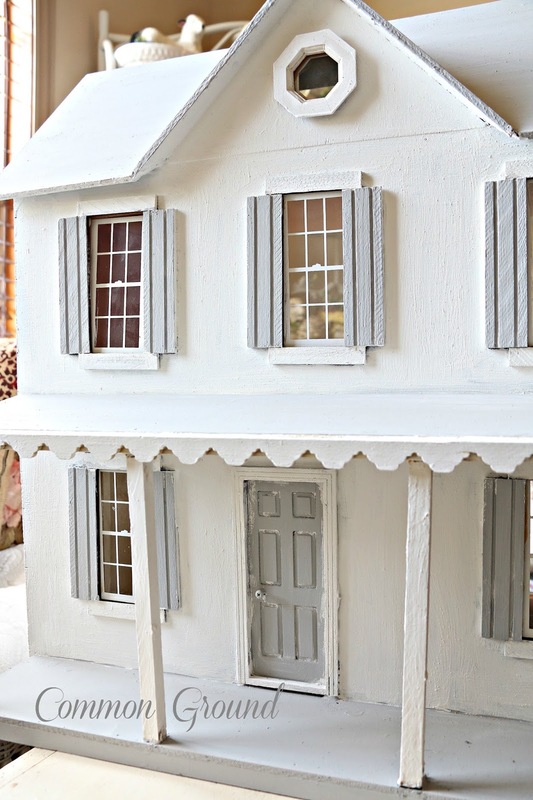 I want a dollhouse so badly!!! My dad built me one when I was about 10, he cut up laundry detergent boxes into little pieces and painted them to look like used brick. It was 3 stories and had a lovely staircase that led all the way up to a little attic room. I loved it so much. My parents divorced before he got to finish it so when I was in my 30's he asked me to ship it to him so he could finish it...I asked my mom for it and she admitted she had thrown it out:( I was sooooooo incredibly sad:( My hubby knows a new one is on my wish list so someday! Yours is lovely! Debra, I love the doll house. I am so sad that just last week, I gave away the girls' dollhouse and now seeing yours and all the other photos, I want to kick myself. It's wonderful to hear from you. Sending lots of love and happiness your way. Oh Debra, your doll house is so pretty. I gave mine away to a little girl who had no toys to speak of and she cried when I gave it to her. But the true be told, I miss mine. Maybe I should get another one and put it together. Seems like everyone has one. Please take it easy and get well. I am sending lots of prayers, love and happiness your way. Oh, Debra - I love your doll house! The only doll house I had growing up was a plastic Barbie house!!! 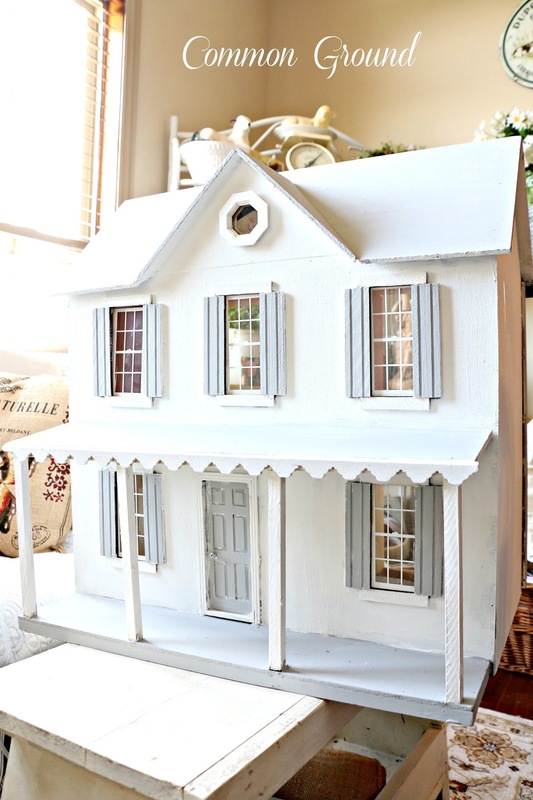 After seeing all of your inspiration pictures, I think I will be on the lookout for a quaint doll house of my own! 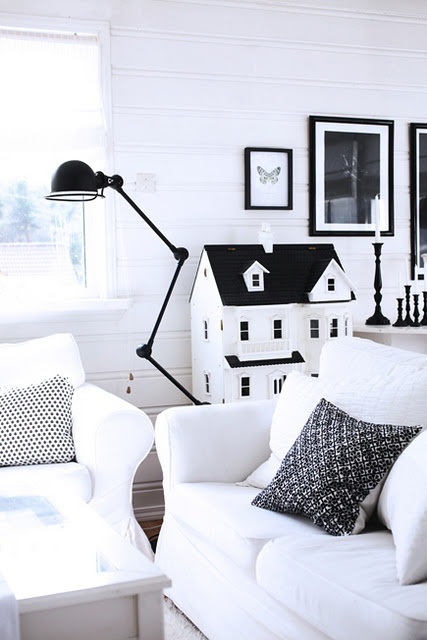 I especially love the barn one that is hanging on the wall as a shelf! Just amazing! I'm so glad you are taking this time that you need - you are in my prayers! 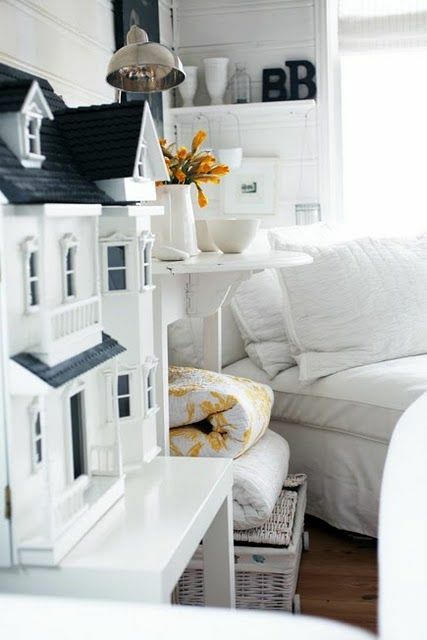 Doll houses do make great decor items. I love all of the ones you shared with us and I also like how you painted yours. You know, the wonkiness makes it seem more like a real home. Humm, well..makes it seem more like my real home, lol. I cringed when I saw the 80's colors because I was guilty of decorating in those colors too..in the big house. I hope you feel better soon. I know how it is to have your health holding you back because I am going through that too and I hate that I can't be all that I want to be but I hope someday soon my time will come and all of the things I have been thinking about doing I will be able to do. Take care. I'm glad to hear you're supervising. Your dollhouse is so lovely, and as everything you set your hand to, you've made it even better! I am so happy to hear from you! I love your dollhouse and one can decorate with them. I can so relate to what you are going through, since I went through a similar situation last year. It was a very difficult time, I would lay in bed and read blog posts, crying because I missed blogging so. I felt as time passed would anyone "miss"me, remember me, would they be there where I came back. Blogging has become so much more than I expected, in many different ways. I love it, I hate it, it's fun, it's work, it's creative, it depleting and so on. Taking time away can be liberating, and can yet, a part of us and who we are was missing. I as well as many others will be here for you. You need to use this time for you, taking care of you, nurturing yourself to pass through this new journey you are on. You are in my thoughts, and honesty I almost sent you a note, just checking in, and then you posted. You have such a beautiful presence in blog land and I felt a loss when I didn't see your blog posts on my reader. You are in my thought and in my prayers. God is watching over you, I know you find comfort in that. I love your dollhouse! The new paint colors are great. I love the inspiration pics you shared of them too. I wish you the best as you continue down this difficult road right now. I love the new look of your painted dollhouse! It's going to be a sweet addition to whatever room you choose to display it in. I hope you are able to relax now that you've taken a break from hosting your blog parties, Debra. Now you can post whenever you like.....or not! Take care. 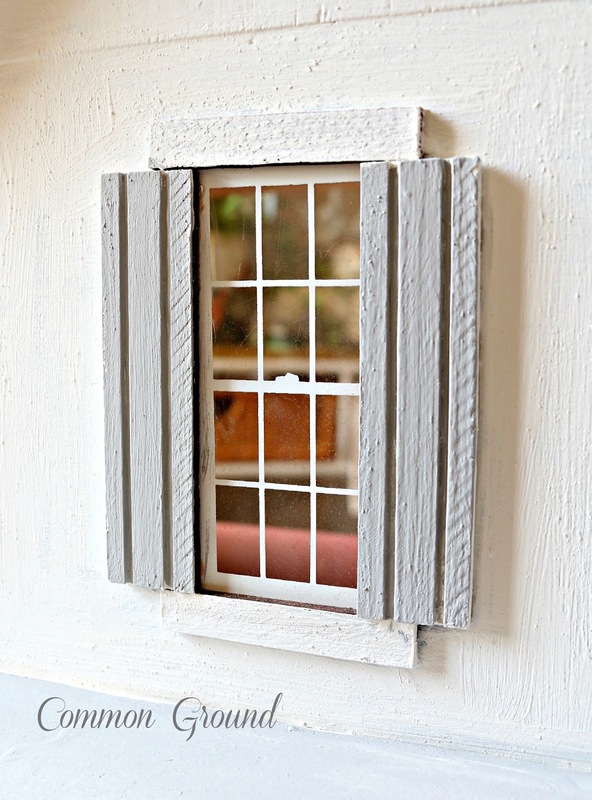 The ASCP gray and white all the rage now...2014...so they are perfect colors to update your daughter's dollhouse. I love it so much better than the original colors, and I am a 'blue' girl. 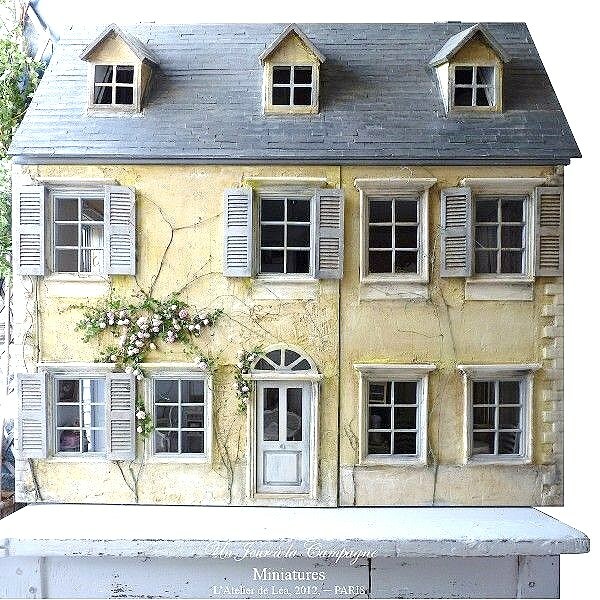 The French dollhouse from Paris is beautiful. 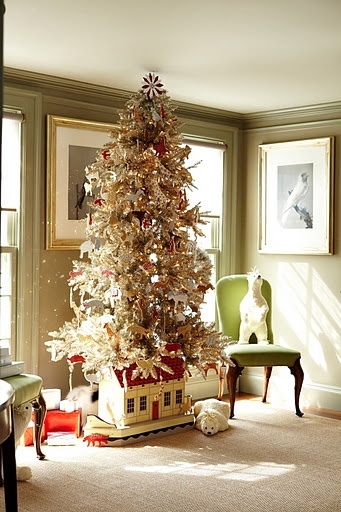 All of your images of how to use dollhouse in decorating are great. You have been in my thoughts as I watched my blogroll every day to see if Common Ground had posted anything. You are missed, but all of us want you to rest and not to over do. Have a wonderful rest of the week. Hello dear Debra, The dollhouse looks so pretty in white with pale blue. What an adorable decoration piece. I had thought of you. Take good care of yourself and rest a lot. Debra, what a cute idea! I would never have thought to use it for display. Love all of the ideas from your Pinterest. Glad that you had hung onto it. 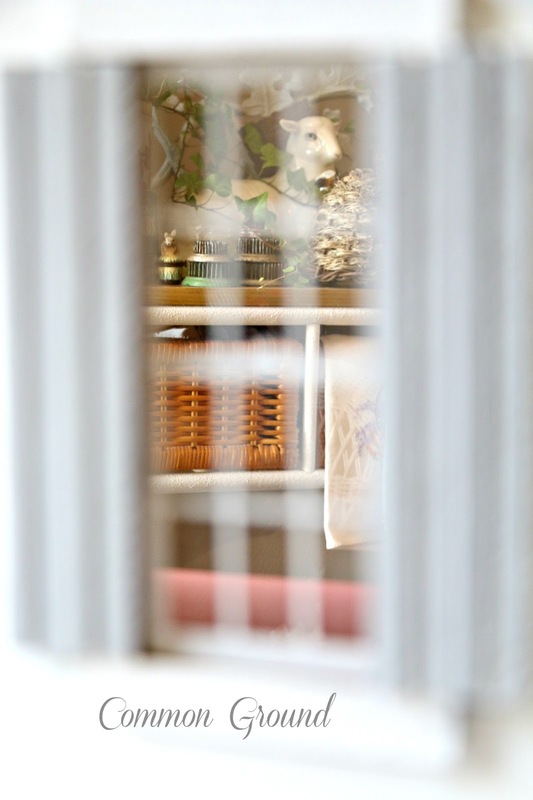 I have a little Americana house in one of my guest bedrooms. I think I may just have to give it a paint job. 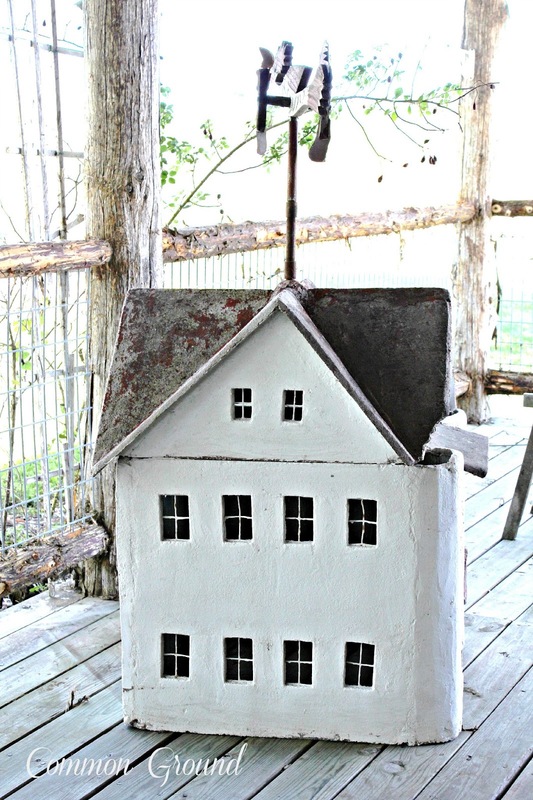 It would look cute on top of my rustic cabinet in the entry. Hope all is well! 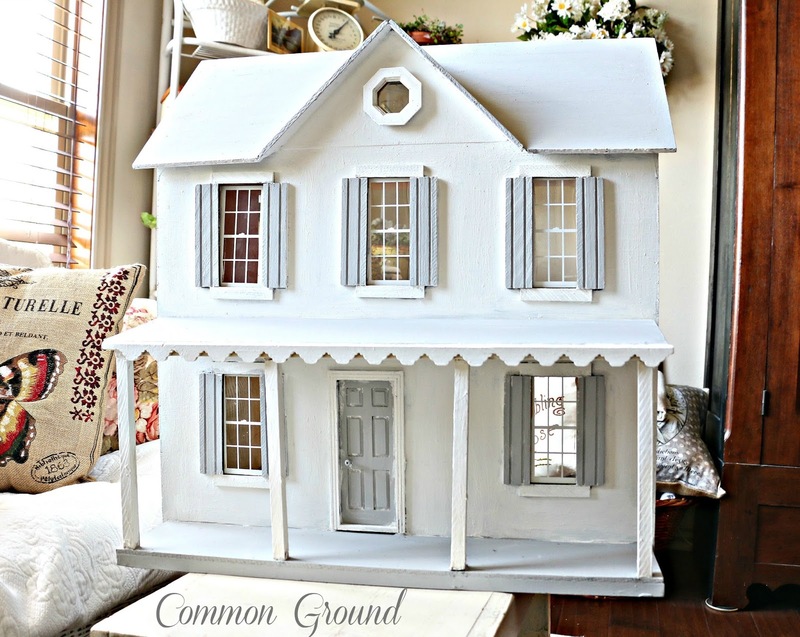 I love that sweet dollhouse:) I know you will enjoy seeing it and remembering when the girls were little! Memories are precious, aren't they? Enjoy your day sweet Debra, I will be keeping you in my prayers! HUGS! So glad to see you back. I have my daughter's doll house tucked under the stairs. Country blue and pink. :) I bet she wouldn't mind if I painted hers. She never played with it but we did have tons of fun creating it back in the day. I hope you are feeling better! You have been missed! This post on your daughter's doll house was liken to a healing balm for my soul, dear friend!!! I think of you daily and ask God to restore your health, give wisdom to your physicians and peace to your soul. Seeing you release your creativity on this project allows me know that you have a "distraction" as you await theforthcoming appointments and surgery. Well said, "It's been a "good" habit for me, but still one that keeps a person always on the lookout for that photo, that topic, that subject that is begging for attention. " Many times, as I look back through photos of the past I do a "oops", don't think I posted that story on the blog. But, I press forward with the present day happenings to keep a "fresh" prospect on the current events of the day! Thank you for this post today. I'll be watchful for more "blast from the past" or news of the future @ Common Ground! I'm thinking that if I were your daughter....I'd want that doll house back!! :) It's A-D-O-R-A-B-L-E !!! Thank you for your inspiring post. 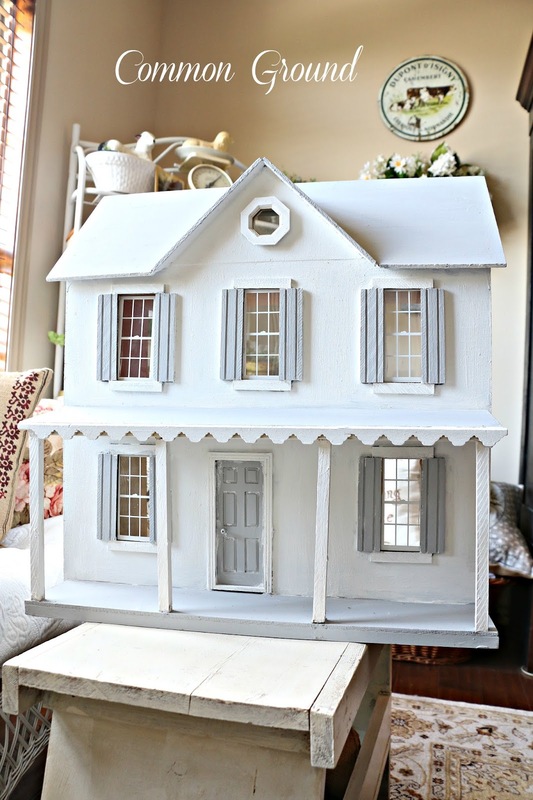 I have a dollhouse that I started working on after I read about using dollhouses for decor on Houzz. Your post encourages me because I also have health issues that require me to slow down and work on smaller projects. Your Pinterest board is full of great ideas! Thanks again! OH MY GOODNESS! I adore this doll house!!! 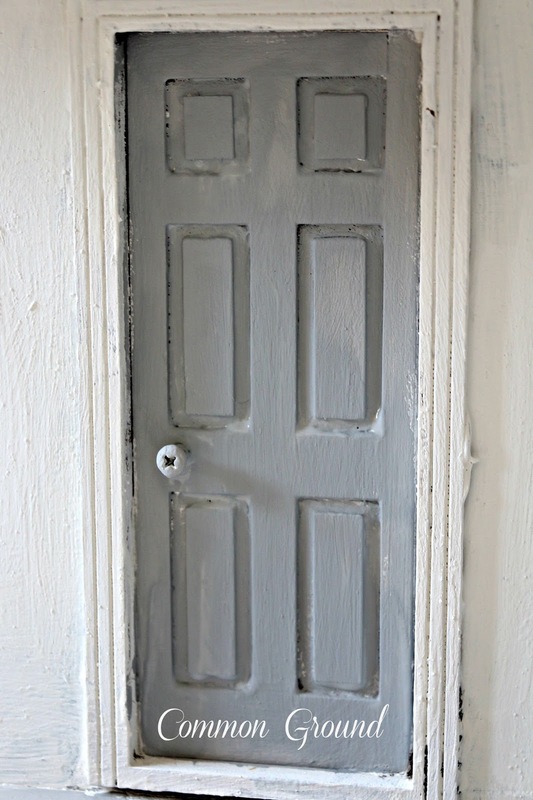 What a wonderful decorating element... and it looks so so different with a new coat of paint!!! 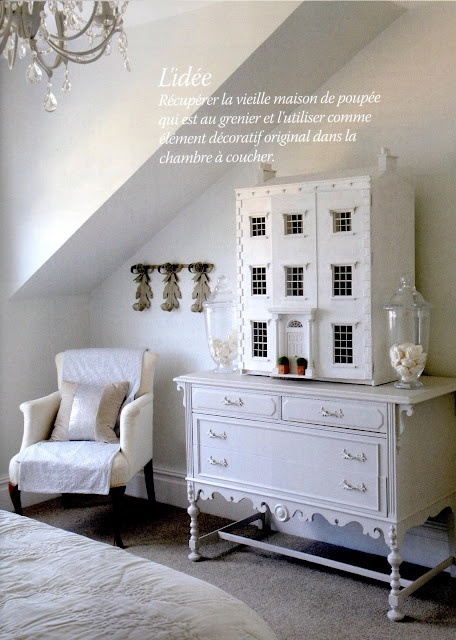 LOVE all the doll house images! Thanks for inspiring me! Wow your doll house is so pretty!! 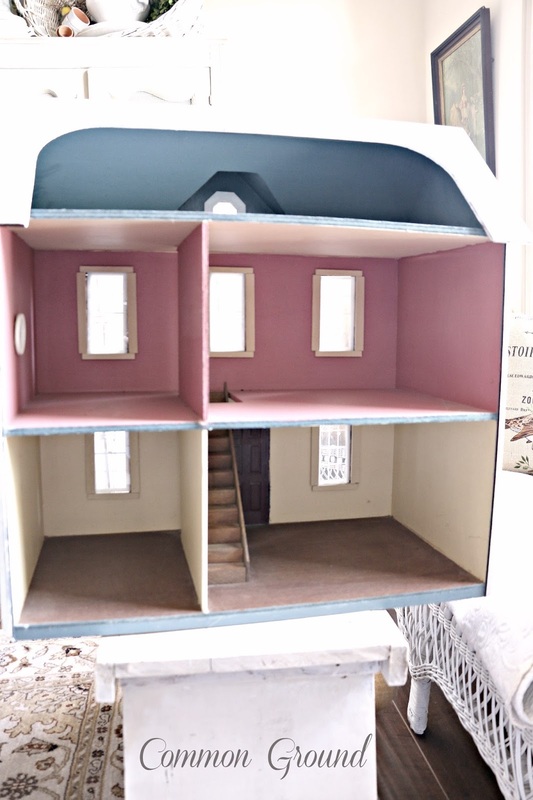 Thank you for sharing all the other doll houses on Pinterest. 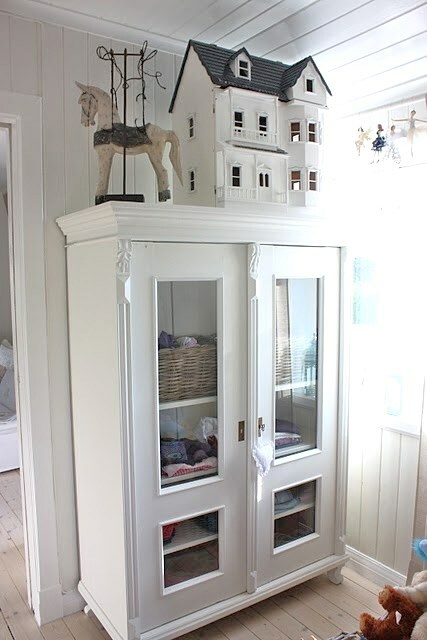 I never thought about using a doll house to decorate a room. I will be on the hunt for one now at garage sales. Love it! I have my childhood dollhouse that I painted quite a few years ago but it was when everyone was painting flowers on everything and I did...painted a fence and boarder around the bottom of the house. I spent a lot of time on that so now I am kinda stuck with the color because I cannot bring myself to paint over all that work. I sure love the colors you picked. Love the new look of the doll house. So pretty! FUN! It looks pretty....and all of those pictures were fun to view! I had to laugh at the one with toilet paper in it. NO! :) :) I think my favorite is the one above that, as it almost looks like an old schoolhouse. I'm sorry to hear you will be needing surgery, Debra, but hope it will help you feel better again. I'm very glad that you are taking time off to take care of yourself...it really is what's important...xoxo Keeping good thoughts and prayers for you! I love what you've done with the dollhouse! It's just lovely. 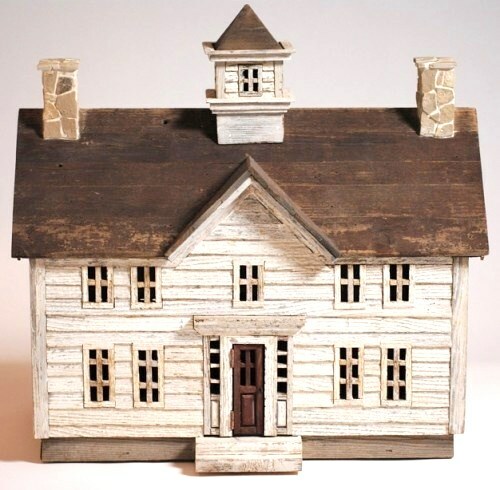 I have an old wooden dollhouse that none of my kids are interested in anymore, but I'm the one who can't part with it! I've used it to hold my decorating books, hide magazines, etc. It needs a little TLC, as well, but I'll get to it one of these days : ) Love all your Pinterest inspiration photos! 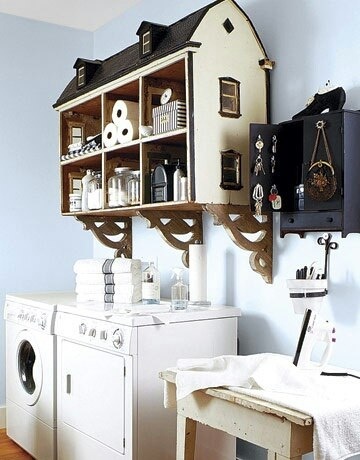 I love dollhouses but had never really thought of using them in decor...genius! So glad you have a little project to work on ;) Thanks for sharing, and take it easy! Debra, I love what you did with the dollhouse. You know I have one that I always decorate with for the holidays in the fall. My brother gave it to me when our girls were little. I love it. Thanks for sharing your dollhouse and so happy that you're still posting . I think of you always and know everything will be ok. Sending hugs! Wow your doll house is so pretty! I love each pictures which shows unique designs and it is good to have these type of decorations for the doll house. I think the doll house looks wonderful! We have one that we built for our youngest daughter when she was 5. She's now married and has two little ones. I think I'll paint the outside and leave the inside for her to choose tiny print wallpapers and paints and carpets. Thanks for the inspiration. Debra, it's so nice to see you taking it easy and not feeling as though you have to blog. I'm glad you're working on smaller projects and leaving the heavy stuff for your family. Hugs to you and take care!